The new Airflo G-shock fly line has been awarded ‘tackle tester’s choice’ in Trout Fisherman magazine! It’s over 30 years since Airflo first introduced a non stretch fly lines to the market and it’s fair to say it was a real game changer so why bring back a low stretch line? In certain circumstances for example when using lighter tippets a percentage of stretch is beneficial to prevent break offs. 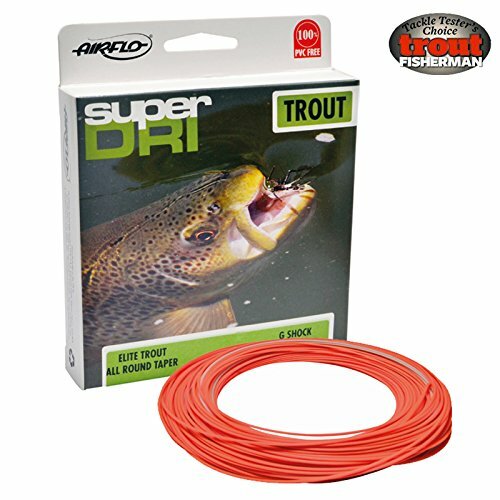 Airflo’s new super dri G-Shock fly line has a controlled amount of stretch of 15% as opposed to 20-25% from other manufacturers, and allows all anglers to enjoy the obvious benefits of Super Dri, in a fly line closer to the stretch level that they are used to in a ‘traditional fly line’, therefore giving a similar feel to a stretchy PVC line, but still allowing you to set the hook marginally better without any fear of breakage. Also ideal for those anglers who have never tried a non stretch and non PVC based line before. Supple with next to zero line memory these lines are sure to become a best seller.The new Airflo G-shock fly line has been awarded ‘tackle tester’s choice’ in Trout Fisherman magazine! Airflo’s new super dri G-Shock fly line has a controlled amount of stretch of 15% as opposed to 20-25% from other manufacturers, and allows all anglers to enjoy the obvious benefits of Super Dri, in a fly line closer to the stretch level that they are used to in a ‘traditional fly line’, therefore giving a similar feel to a stretchy PVC line, but still allowing you to set the hook marginally better without any fear of breakage. Also ideal for those anglers who have never tried a non stretch and non PVC based line before. Supple with next to zero line memory these lines are sure to become a best seller.